Late President Muhammadu Buhari yesterday vowed that his government would fight again if need be to secure the unity of Nigeria. He vowed to deal with the agitators for the creation of Biafra State, who he said wanted to disintegrate Nigeria. 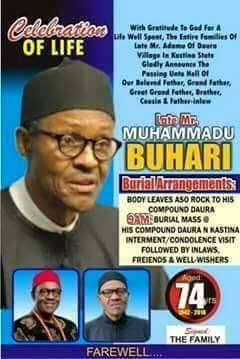 Buhari spoke while paying homage to the Emir of Katsina, Alhaji Abdulmumini Kabir Usman, at his palace. “I am ready to fight back to defend the country from those agitating for the creation of Biafra State, even if we will get drowned,” the president stated. Buhari, who said he had undergone discipline from his parents and teachers while growing up as a teenager coupled with the good training he got as a military officer, said that he would never condone indiscipline from people who did not mean well for the country. The president also said that the ongoing war on corruption was not aimed at witch-hunting anyone or group of people in the country. He vowed that those that looted public treasury would not go scot-free since the country and the citizens had been treated woefully within the last 16 years. The president pledged his administration’s readiness to ensure justice among all Nigerians. He said the public treasury was looted by a few individuals to enrich themselves, adding that the country was left with empty treasury. On the current economic hardship being experienced in the country, the president attributed such hardship to dwindling oil revenue occasioned by the unstable global oil price. He, therefore, called on Nigerians to diversify their means of livelihood by engaging in agricultural activities to alleviate their sufferings. “People should go back to farm; those that cannot farm should source for self-reliance programmes which is better than stealing.” In his remarks, the Emir of Katsina, Alhaji Abdulmumini Kabiru Usman, called on the Federal Government to fulfill its promises of completing the dredging of River Niger, as well as the Katsina State water and dam projects to boost irrigation farming in the state. The Emir also called for the Federal Government’s intervention in reviving teacher-training colleges to uplift the quality of education in the country. He enjoined Nigerians, particularly the elite, to support and show more understanding to the Buhari- led administration by offering special prayers for the success of the government. Buhari, however, solicited the support of traditional rulers, religious leaders and well-meaning Nigerians to mobilise the citizenry toward serving the interest of the country, at all times. In his remarks, the Emir commended the president for the steps so far taken by his administration to give a new vitsa of hope on the future of the country.